SPANISH police said they had killed four people to foil a second attempted attack, hours after a van ploughed into people in Barcelona, killing up to 16. The force said that the shootings were linked to an imminent terror attack in Cambrils, a small port town around 70 miles south of Barcelona. A suspected imminent terror attack in the town prompted them to launch the operation, the force said in a tweet. A spokeswoman for the force said that officers shot dead four alleged perpetrators and injured one more during the raid. Spain's public broadcaster, RTVE, is reporting that the suspects may have been carrying suicide explosive belts, although police did not confirm this. It added that the suspects tried to carry out a similar attack to the one in Barcelona, when a van ploughed into people on Las Ramblas, killing 13 and leaving scores more injured. It said seven people were injured by the suspects, two seriously. The channel ran a video of Cambrils' promenade in which volleys of gunshots could be heard while sirens wailed and people's screams could be heard. Catalan president Carles Puigdemont thanked police involved in the operation in these "critical and tragic hours". TERROR has struck at the heart of the Spanish city of Barcelona, with at least 16 people reported dead after a van ploughed into crowds on the famed Las Ramblas tourist street. The attack, which came mid afternoon Spanish time, also left at least 100 people injured - 15 of them critical - Catalan police have confirmed. Barcelona terror: Graphic video shows aftermath: A GRAPHIC video of aftermath of the Barcelona terror attack has been posted online showing bloodied bodies strewn across the pavement. Several attackers have been shot dead in a clash with police during an incident involving a second van in the Spanish seaside town of Cambrils, south of Barcelona, Spanish media say. It's not clear how the incident is linked to the van attack in Barcelona. Islamic State has reportedly claimed responsibility for the terror attack, according to the Amaq news agency. Three of those injured are Australians, including two men from Melbourne and a woman from Sydney. 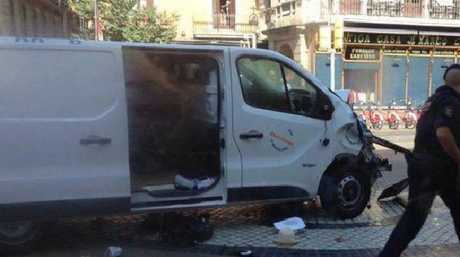 Local newspaper La Vanguardia says all four attackers were killed after they crashed their van into a pedestrian zone - injuring five people. Explosive belts and firearms were recovered from the scene, it reports. Reports suggest the van had been intercepted by a police patrol, and a chase ensued. The van crashed into a pedestrian area on the esplanade of the seaside town and over-turned. A shootout with police followed. Police warned local residents and tourists at nearby hotels to stay indoors: "If you're now in Cambrils, avoid going out. Stay home, stay safe," the region's civil defense agency said in a tweet. At least one Australian from NSW is reported to be in a serious condition. Foreign Minister Julie Bishop said two Victorians were waiting to seek medical attention for minor injuries, and the total number killed in the incident was 16. This death toll is yet to be confirmed. Eyewitnesses said the van was travelling at speeds of up to 80km/h when it mounted the footpath, and then zig-zagged down the Las Ramblas promenade for up to 500m before it came to rest with a badly injured person crumpled near the front wheels. Two men - a Spanish national and a Morroccan - have been arrested in relation to the attack but police said the driver of the van was still on the run. 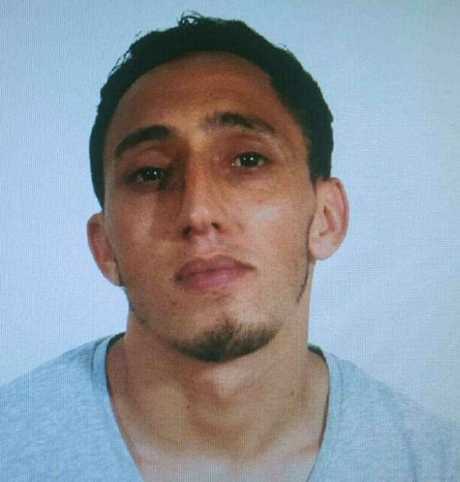 The 28-year-old Catalan resident of Moroccan origin later handed himself in to police in Ripoll, about 100km from Barcelona. Oukabir claimed that his younger brother, Moussa Oukabir, 18, had stolen his documents. "It was clearly a terror attack, intended to kill as many people as possible," Josep Lluis Trapero, a senior police official, told a news conference this morning. The arrests took place in the northern Catalan town of Ripoll, and in Alcanar, some200 kilometres south of Barcelona, the site of a gas explosion at a house earlier in the week. Police suspect the explosion is linked to the van attack. Trapero said the explosion left at least one person dead, and police suspected those in the house were "preparing an explosive device." "It seems there was an accumulation of gas that generated the explosion," he said, without giving further details. The town of Cambrillis, the site of an ongoing police operation, on the coastal road between Barcelona and Alcanar. Catalan police said at least two police were run over when a Ford Focus broke through a checkpoint. Police say the officers suffered only minor injuries and didn't need to be hospitalised. Foreign Minister Julie Bishop said a NSW woman was in a serious but stable condition. "We know she is in a serious but stable condition, our consular staff will be at the hospital as soon as possible," she said. Ms Bishop said two young men from Victoria had also been hurt. "They have gone back to their hotel and will seek medical treatment in the morning," Ms Bishop said. "I'm not sure if they have injured or they just need to see a medical professional in the morning." She said "there could be more" Australians injured. "I ask all Australians in the vicinity to contact local authorities to let them know of their whereabouts and to contact their loved ones back in Australia," she said. "Our honorary consul stationed in Barcelona for a number of years is visiting hospitals and keeping in close contact with the authorities," Ms Bishop said. Attorney General George Brandis said the government condemned the attack "in the strongest terms" and said "Australia stands in solidarity with Spain in the wake of this appalling attack. "Australians who concerns for the welfare of family and friends in the region, should attempt to contact them directly. If you're unable to contact them and still hold concerns for their welfare, you should call the Department of Foreign Affairs and Trade's 24-hour consulate emergency centre on 1300 555 135." Bianca Shaw from Canberra only learned of the attack by turning on the TV in the room. "I was with my partner, we had just left Las Ramblas to head back to our hotel for a nap before we headed back out for dinner and drinks," she told 3AW. "We were actually woken up by some messages from friends that we were travelling with previously before we got here." Ms Shaw ventured outside with her partner, but stayed close to the hotel. "They were asking are you okay and what's going on? Because we're actually staying a couple of metres away from the Las Ramblas section. We turned on the TV and it was absolutely filled with all the news about the terror attack and we just found out from there." "We went outside probably about an hour after we heard about everything. We had been watching the news for a while and they had been jumping from one person dead and then all of a sudden it was 13 people dead. "We didn't really know what was going on and we went outside and there were people everywhere. "There were police cars actually quite close to where we were so we thought it might be best to actually stay in our hotel. "The hotel staff were recommending that nobody leave the hotel." "We had just gone down stairs to find out what was happening from the staff. The staff were at the door and they were recommending that nobody go outside because police were running past with big guns." "It's a really scary situation when you're walking back from your day of sightseeing and you're deciding whether to have a drink out in Las Ramblas or walk back to your hotel room and we chose the latter," he told 3AW. "Fifteen minutes later, you're looking over the balcony from the top of the roof top bar while you're having a drink and there it is, all happening in front of you. "You hear the screaming, the mayhem, you look over the top and there are at least five bodies that I saw and unfortunately, I believe three of them, well they're still there now in body bags so you can imagine obviously they've passed. It's very, very scary. The place is still in lockdown." Australian Susan McLean, who is in Barcelona, spoke with Sunrise by phone this morning. "It was too close for comfort," she said. "I was in a shop doing some shopping and my husband, being a good husband, was standing out the front. "I went out to get him because I want to show him something as I went out, there was a tidal wave of people running from Las Ramblas around the corner down our street. "They were panicked, they were running for their lives. "They were screaming, they were crying hysterically. Immediately we knew something terrible had happened. " "It is night time now, it is 11:20 at night. We were ordered to stay inside and we were told after this that they are not wanting people to go into the street. "The only sounds we've been hearing our sirens and a police helicopter, both of which have stopped now. "They are still saying we should stay inside even though it believed the two suspects have been arrested. What they wouldn't want is everyone to leave their hotel and see what's going on." Spanish Prime Minister Mariano Rajoy said that they would use "maximum coordination to arrest the attackers, reinforce security and attend to all those affected." On Twitter he added: "We are united to defeat terrorism. The Government of Catalonia, Barcelona and all the security forces are backed by the Government." "The priority is to attend to those affected, detain the killers and restore normalcy. The Spaniards will defeat terrorism." In a statement released on Twitter the Spanish royal family said, "They are murderers, nothing more than criminals who are not going to terrorize us. All of Spain is Barcelona. Las Ramblas will go back to being everyone's." "Resolute with Spain in the fight to defeat terrorism we condemn the terrorist attack in Barcelona. Our love & prayers are with the victims," Australian Prime Minister Malcolm Turnbull said. Attorney general George Brandis said, "The Australian government condemns this attack in the strongest terms and our thoughts and sympathies are with the victims of the attack and their families." Devastating news from Barcelona. All Australians condemn terrorism, all of us hold the people of Spain in our heart today. Donald Trump condemned the attack and offered US assistance. "The United States condemns the terror attack in Barcelona, Spain, and will do whatever is necessary to help. Be tough & strong, we love you!" Britain's Prime Minister said that the "the UK stands with Spain against terror" following the van attack in Barcelona that killed at least 13 people and injured dozens of others. Spanish Prime Minister Mariano Rajoy tweeted: "In contact with all administrations. Priority: tend to the injured in Las Ramblas and facilitate the work of security forces." The Spanish royal household said on Twitter: "They are murderers, nothing more than criminals who are not going to terrorise us. All of Spain is Barcelona. Las Ramblas will go back to being everyone's." Barcelona Mayor Ada Colau said a minute of silence would be held on Friday in the city's main square "to show that we are not scared" following the van attack. Spain has so far been spared the kind of extremist violence that has occurred in nearby France, Belgium and Germany. Vehicles have been used in several terror attacks in Europe in recent years, including a jihadist massacre that claimed 86 lives in the French Riviera city of Nice. That onslaught in July last year and other similar attacks were claimed by the Islamic State jihadist group.